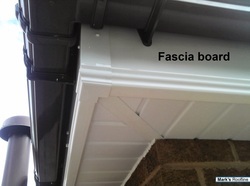 The fascia is the timber board that attached to and closes in the ends of the roof rafters at the eaves. It appears as a horizontally running band that is situated vertically underneath the roof edge between the roofing material and the soffit overhang and provides a surface to which the gutter is attached to. Being situated where it is it the fascia board is open to the elements of the Great British weather and will eventually rot without regular maintenance. 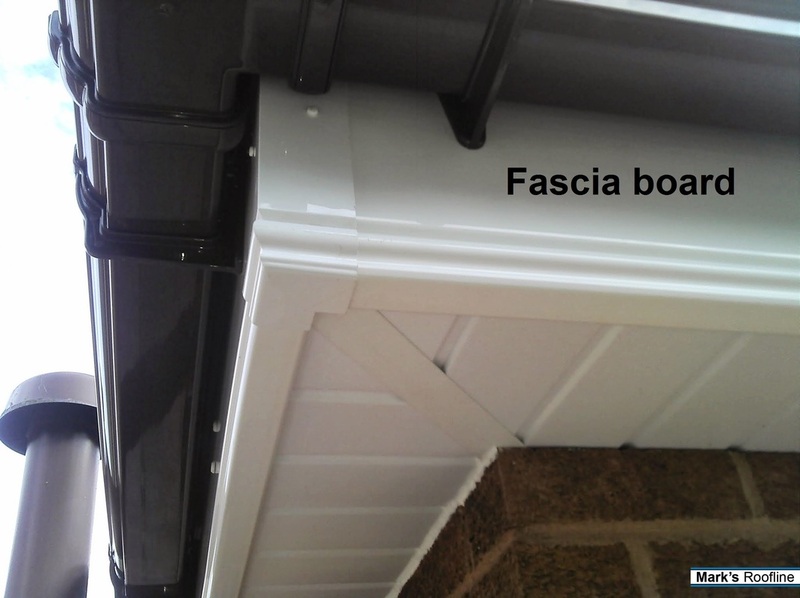 We supply and install a range of durable PVC-u replacement fascia board products and provide a bespoke service suited to cater for all budgets. Guaranteed not to rot, discolour, warp or twist our fascia boards are available in white, mahogany, rosewood, light oak and black ash finishes and in 16mm thickness from Kalsi Group and 18mm thickness from Freefoam. Profiles available are square leg in all colours and ogee (pictured) in white only. 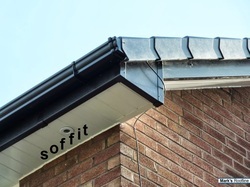 The soffit is the product used to enclose the horizontal underside of an eaves and it runs from the underside of the fascia back to the wall. It is the underneath part of a roofline, although not all buildings have them. 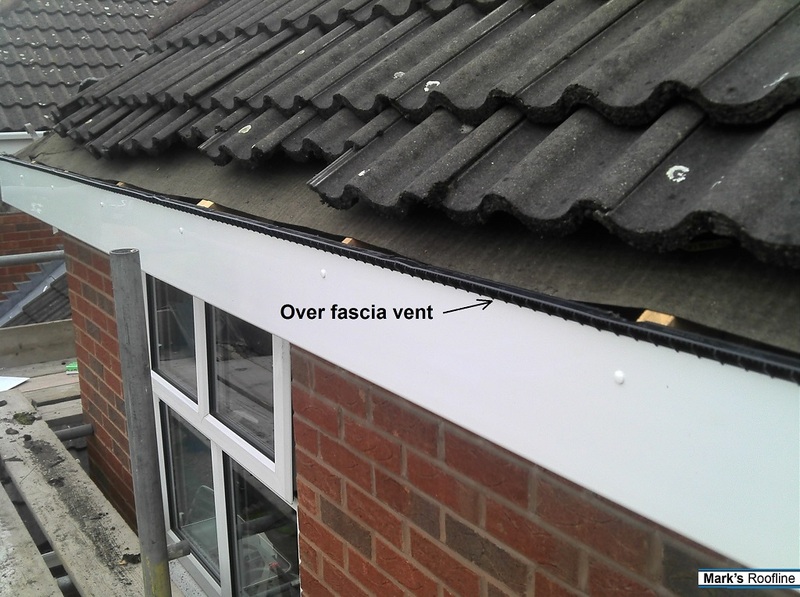 Like the fascia, although not quite as exposed, it is still open the weather and can perish over time. We supply and install a range of durable PVC-u soffit boards and provide a bespoke service suited to cater for all budgets. Guaranteed not to rot, discolour, warp or twist our soffit boards are available in white, mahogany, rosewood, light oak and black ash finishes and in 10mm thickness from Freefoam and Kalsi Group. Profiles available are Tongue and groove, flat board and vented flat board. 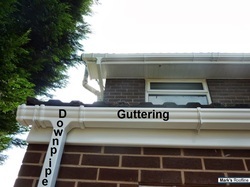 The guttering and down pipes carry the flow of rainwater down from the roof and into the drains. The gutters are usually always attached to the fascia board unless the building has open eaves and run with a slight fall towards the outlet. The down pipes run down the wall from the guttering outlet into the drain. The guttering and down pipes are susceptible to leaks and discolouration with age. They are also susceptible to holding water in places if not correctly installed. We supply and install a range of guttering and down pipe products from Flowplast. They are available in 3 colours, white, black and brown and 3 different profiles which are half round, square and niagara ogee (pictured). 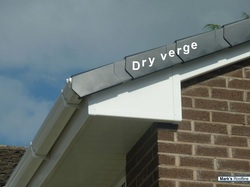 Dry verges eliminate the need for mortar pointing to the end roof tiles on a gable end. Mortar has a tendency to shrink, crack or crumble over time and will often fall out or allow water to enter the roof space through cracks. 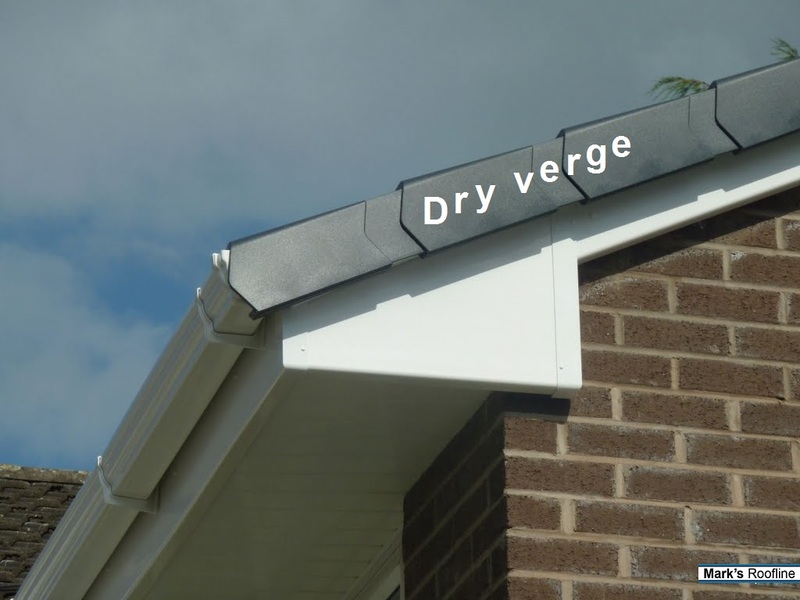 We install dry verges from Manthorpe or Klober as standard, available in charcoal, brown and white. underlay at the eaves, which leads to long-term degradation of the felt. Once the felt underlay has perished, the eaves are vulnerable to the ponding of water behind the back of the fascia board. 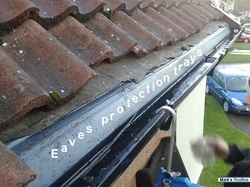 Highly recommended when fascia boards are replaced, we install eaves protection trays as standard. Designed to be fitted on the top of the fascia board, the over fascia ventilator discreetly ensures a positive passage of airflow into the roof space. Without adequate ventilation, condensation can build up in the roof space. We provide roof ventilation to all our installations and over fascia vents provide a better, more extensive and cleaner alternative to circular soffit vents or vented soffit board which attract dirt and grime and becomes an eye sore a after only a few years after installation. Designed for use with profiled tiles. 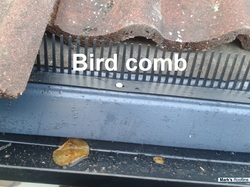 The comb filler creates a barrier against birds and prevents them entering the cavity between the tiles and the roof felt. We often find bird infestations in roof spaces that have profiled tiles. 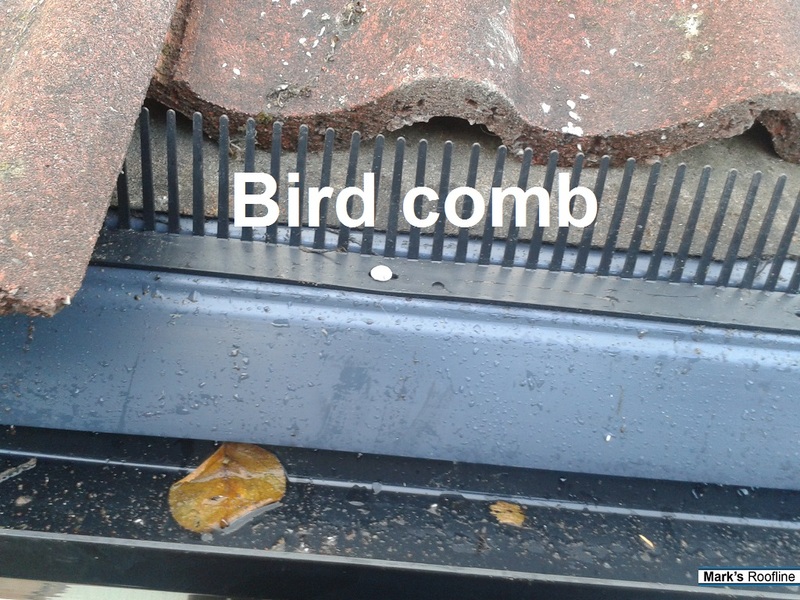 We install bird comb as standard to all our installations that have profiled tiles.